It is a real delight to join you at the Belt and Road Initiative and Green Finance Forum. In the past five years, I have spoken at many forums on the Belt and Road Initiative (BRI) and attended numerous events on financial cooperation. But today’s forum is the first one that seeks to combine these two important topics. I think the theme of the forum is well chosen because it highlights two hot topics of the day. The first one is green development. In face of the increasingly pronounced global challenges, such as climate change, environmental pollution and resource shortage, green development represents the main trend of world development. The financial sector, at the centre of modern economy, plays an indispensable role in promoting global green development and addressing climate change. Closer international cooperation on green finance will lead more capital to green industries. It will draw public attention to eco-protection and promote joint efforts in environmental conservation and improvement. It will also open up new areas and create new dynamism for deeper business cooperation. The second hot topic is the BRI. and to pursue cultural exchanges and mutual learning. These efforts conform to the trend of the times. They show a new direction for sustainable development in the world. And they are fostering a new platform for the new round of globalisation. As of today, more than 140 countries and international organisations have signed cooperation agreements with China on the BRI. 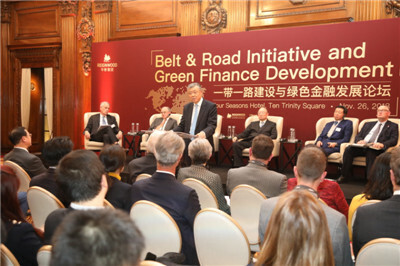 The fundamental ideas of the BRI have been incorporated into the outcome documents of important international mechanisms, such as the UN and G20. First, it reinforces existing mechanisms of China-UK cooperation on financial services. This year marks the tenth anniversary of the launch of the China-UK Economic and Financial Dialogue. After ten years of strenuous efforts on both sides, this mechanism has become one of the important pillars of China-UK exchanges and cooperation. It is also the main platform for our two countries to enhance macro policy communication and coordination in the financial sector. Of the 72 outcomes reached at last year’s Dialogue, more than half are on financial services. Another joint effort of both governments is the publication of the China-UK Strategic Plan for Financial Services. This document points the way forward for enhancing our cooperation on financial supervision. The governments of our two countries also helped launch the China-UK Financial Services Summit. This private-sector-led Summit aims at providing all-round intellectual support to our financial cooperation. China-UK cooperation on green finance is guaranteed strong support from all these effective mechanisms and will in turn reinforce these institutional pillars. Second, China-UK cooperation on green finance creates huge opportunities for building a green Belt and Road. Green development is a natural and inevitable choice for China in achieving economic restructuring. It is also the basic needs of the countries along the BRI routes in their pursuit of sustainable development. Over the past five years since the BRI was proposed, China has focused a great deal of efforts on building a green Belt and Road. These efforts have tapped the huge potential for green investment and financing, and promise an enormous market for a new generation of green products and green technologies. The Belt and Road has become a reservoir of green development opportunities. The UK’s knowledge and expertise in international financial services, and its close cooperation with many countries along the BRI routes, have given it a unique strength in financing BRI projects, Public Private Partnership and green finance. This makes the UK a natural partner of China in building a green Belt and Road. I am confident that China-UK cooperation on green finance along the Belt and Road will enjoy huge potential and a promising future. Third, China-UK cooperation on green finance along the Belt and Road leads and promotes global cooperation in green development. China and the UK have been leading global development in green finance. The cooperation between our two countries in this area has maintained a sound momentum. We co-chaired the G20 Green Finance Study Group and we launched the China-UK Green Finance Taskforce. These efforts have effectively encouraged innovation in green finance and enhanced connectivity between green bond markets. As the first Western country to have issued RMB sovereign bond, the UK is cooperating vigorously with China on green bond. In 2015, the Agricultural Bank of China listed green bond equivalent to $1 billion in London, and signed the Memorandum of Strategic Cooperation in Green Finance with the London Stock Exchange Group. In 2016, the Bank of China issued the first Green Covered Bond worth $500 million in London. 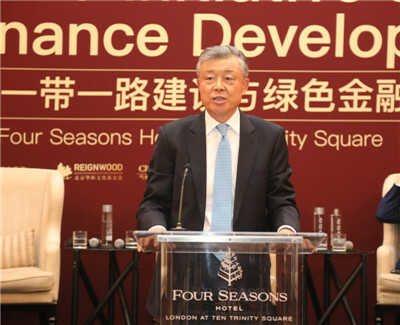 China-UK cooperation on green finance is thriving. It will surely be a boost to the development of global green finance. This year marks the 40th anniversary of China’s reform and opening up. This great endeavour has not only brought about profound transformation in China but also far-reaching impact on the world. In the next 40 years, China will open its door wider. This will create more opportunities for the world. In the financial sector, China will substantially ease market access. We will work with the UK to accelerate the preparations for launch of the Shanghai-London stock connect, which will surely open up broader prospects for China-UK cooperation on green finance. Next year, China will host the second Belt and Road Forum for International Cooperation (BRF). This will be an important opportunity to build on the achievements of the first BRF, cement consensus and identify key areas for future cooperation. Through these efforts, we hope to take the international cooperation on the BRI to a new level. The UK is a “natural partner” of China in advancing the BRI. I hope that the UK will engage in BRI more vigorously and substantially and join us in deepening and broadening China-UK cooperation on the BRI. It is also my hope that this forum will bring out more insights on how to tap our potential in green finance under the framework of the BRI, so as to elevate and expand our cooperation on green finance. I look forward to stimulating discussions and enlightening suggestions on the development of the BRI. In conclusion, I wish this Forum great success!